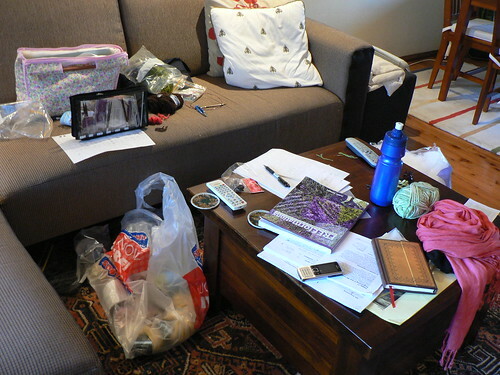 Let’s start with how my old craft space (aka living room) used to look like. Hmmm… pretty embarrassing. I would squeeze myself into a corner of the sofa and have a massive craft explosion around me. I would slouch over my work for hours and have a terribly sore back and shoulders by the end of it. No matter how much I try to prop my back straight with the cushions, I just ended up hunched over again. And just before the hubby gets home, I would go into a frantic clean up so we can actually use the living room together. It had reached a point where I was rather unhappy with my own messiness. My work space just didn’t flow and I wasn’t having much fun. I headed to Kmart immediately and came back with several cheap organizing solutions. 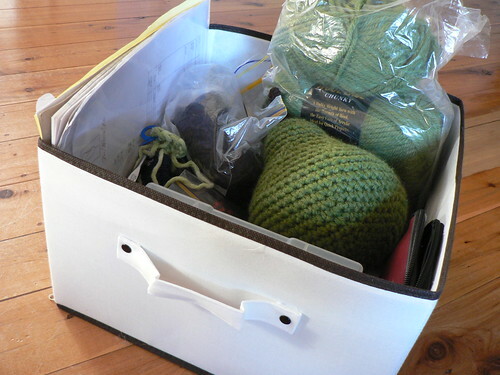 The foldable fabric project box and plastic containers cost me less than $20! Doh! I kicked myself for not buying these sooner. I was crocheting with my plastic 6.5mm crochet hook the other day and snapped it! My tension was clearly too tight but that also meant buying a new hook to finish my project. 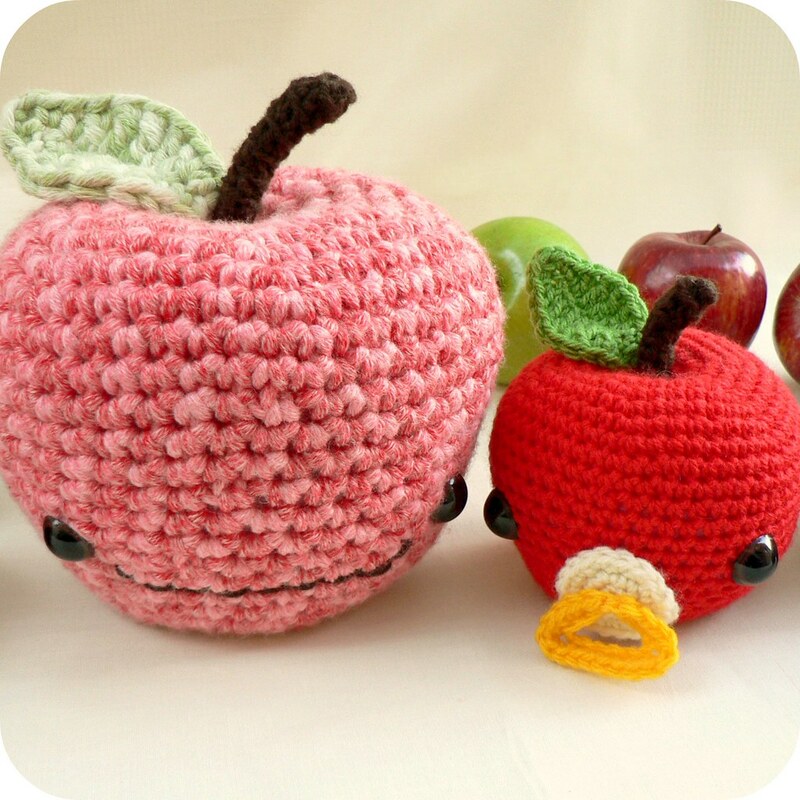 I looked online for a crochet hook set and came across the Boye Crochet Master set. 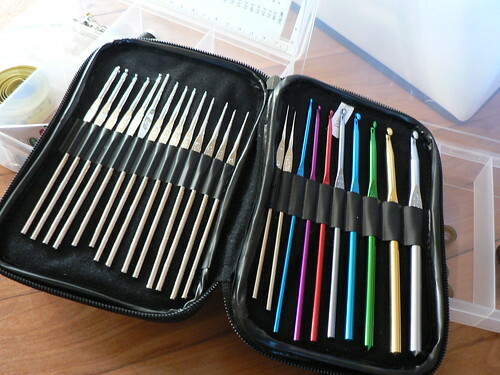 24 hooks and carry case for only $27+postage. Ordered the set immediately from OzQuilts and the set arrived 2 days later. I love speedy services! Aren’t they spiffy? Into the project box they go- neat, tidy and very accessible. I’ve also been wanting to buy a chair specifically for crafting for years now. I’ve searched the web and gone to Ikea and other furniture shops several times to try out chairs but nothing felt right. Plus the wallet was too thin to justify a hobby chair. Then I got into exercising again. I’ve been bushwalking every weekend and doing yoga several mornings a week. 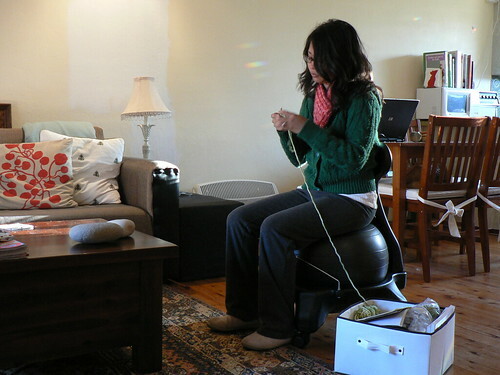 I was tempted to blow up my fitness ball again to use as a chair like I used to but I thought I’d just have a look at how much a proper fitness ball chair would cost. $80 delivered! That’s crazy! Did I buy it? Heck yeah! It was easier to justify the purchase as it’s for my exercise AND craft. Here’s to good health! P.S. 50 points if you can spot Olly, my ginger cat in one of the photos! 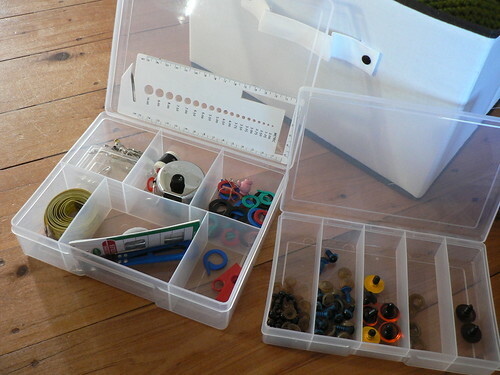 such great project boxes and storage!! I LOVE your exercise chair, it’s aweomse. Your chair is fabulous! I slouch and scrunch, too, so I often have sore shoulders and back after crafting. i have NEVER seen a chair like that before. thats pretty cool. Okay…so is Olly on the chair under the table?? Nice chair Salihan! I´m sure it has good effect to the back and bearing. 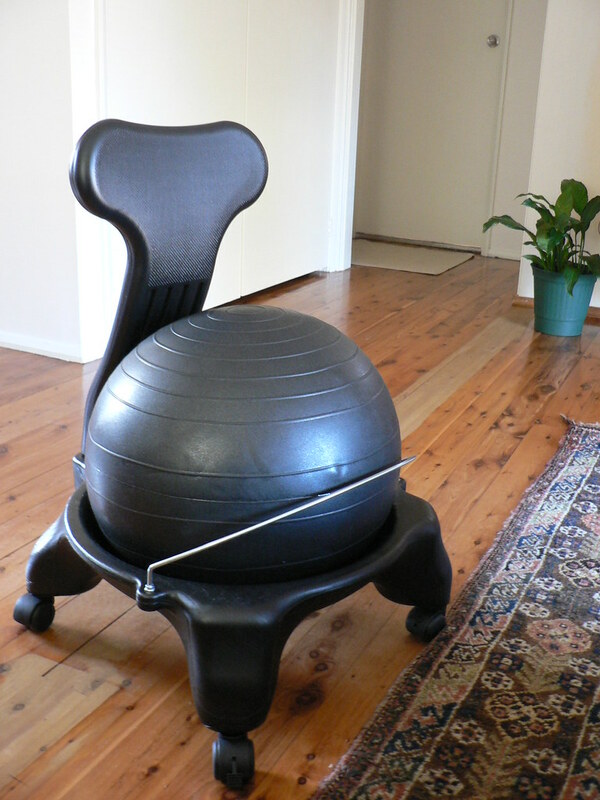 I have fitball chair envy! You should see my space right now. It’s the direct opposite of yours. Love what you’re doing for your back. Your body must really love you for taking such good care of it. Health is wealth! I too can see Ollie under the table. Show us his chubby cheeks if you can. I really want one of those chairs now!! I’m a big sloucher and that would be fabulous – perhaps even for the computer. I have to know… do you really sit in this chair? It looks uncomfortable, but my posture really needs help! It’s actually very comfortable. Friends and family who’ve sat on it are pleasantly surprised too! 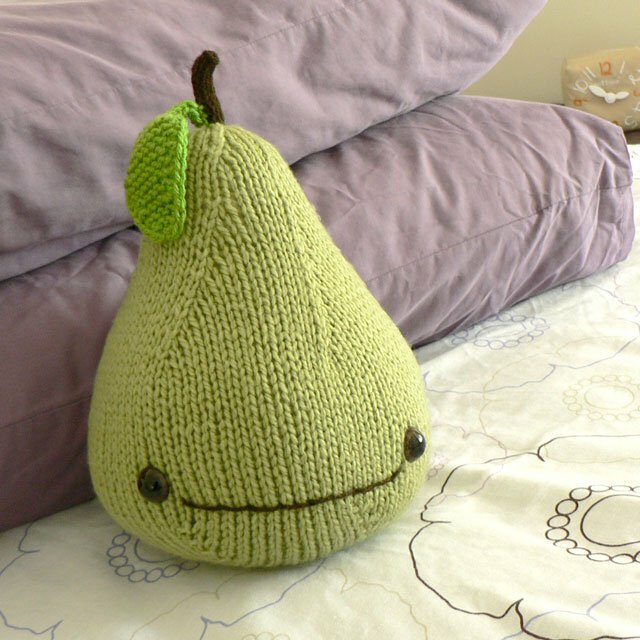 I use it all the time, especially when I’m crocheting or knitting.